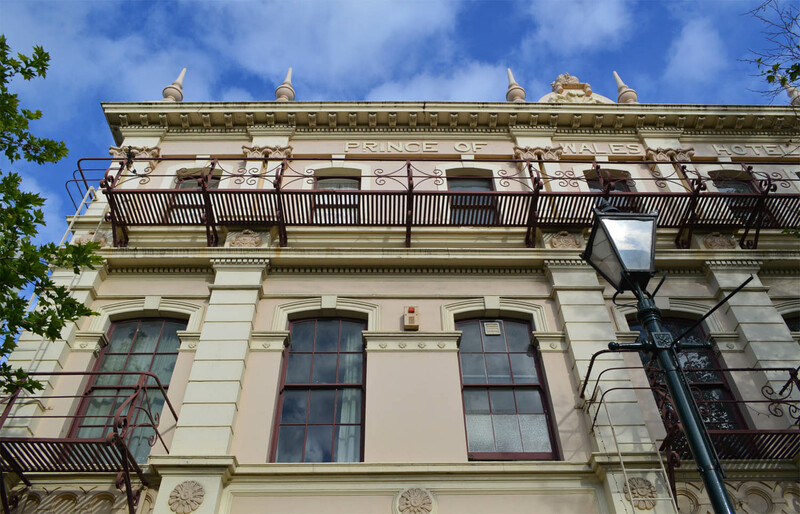 These buildings may be scruffy and disfigured, but they’re among the richest sites of social and cultural history in Dunedin, which makes them more exciting than many structures with grand porticos or pretty turrets. 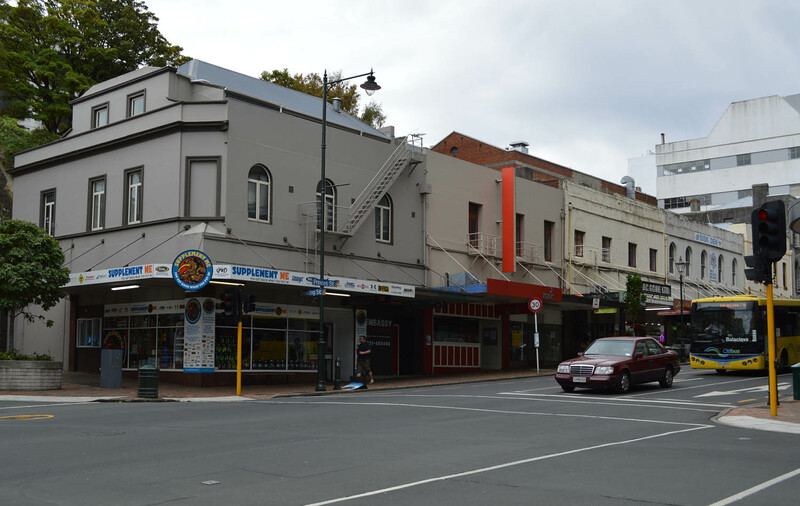 They are also among the very oldest commercial buildings in the city. 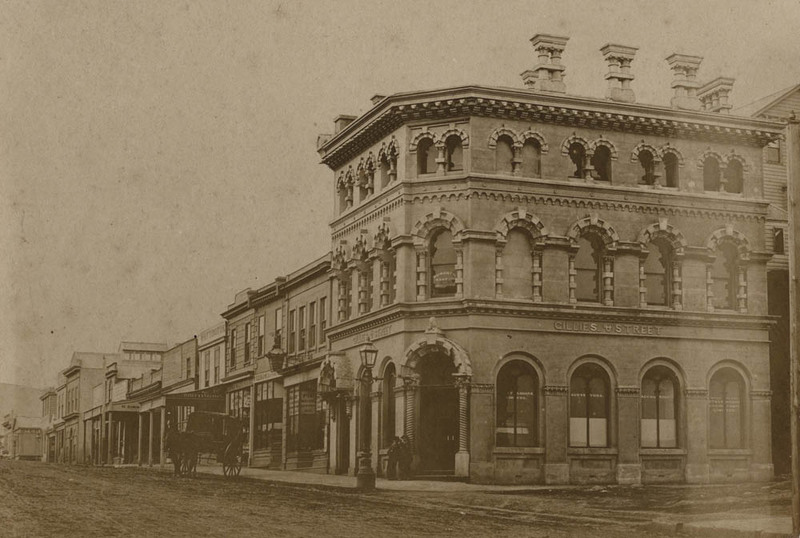 Farley’s Buildings were erected for Henry Farley (c.1824-1880), a colourful entrepreneur whose business ventures in Dunedin included the Vauxhall Pleasure Gardens and Farley’s Arcade (later redeveloped as Broadway). The brick buildings with stone foundations were erected between July and November 1863, and a report in the Daily Telegraph told readers: ‘Mr C.G. Smith is the architect of this very comprehensive pile of buildings, and its design, as a specimen of architecture, is extremely creditable to him’. 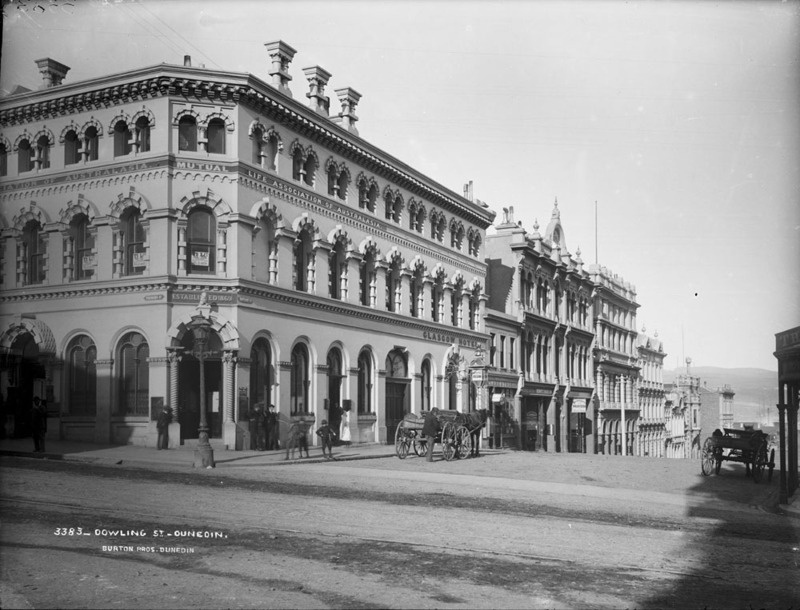 Not much is known about Charles Smith, but he designed Dunedin’s Theatre Royal (1862), and claimed to have designed theatres in Sydney and San Francisco. He later worked on the West Coast. 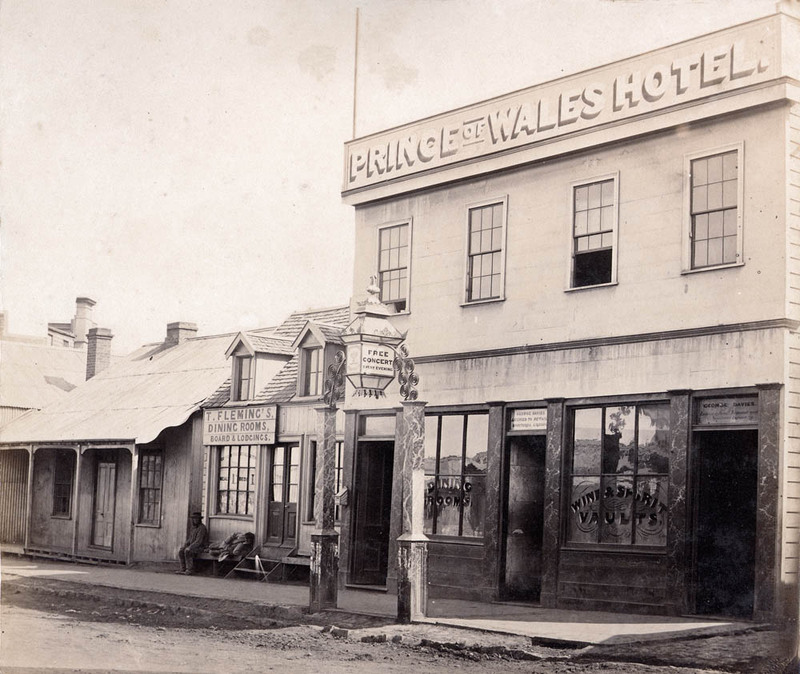 Most of the buildings in Princes Street at this time were timber constructions, so Farley’s Buildings represented striking progress at a time when fires were frequent and gold rush money was still only beginning to make an impact. The buildings originally had unrendered brick facades but photographs show that the upper brickwork deteriorated quickly. 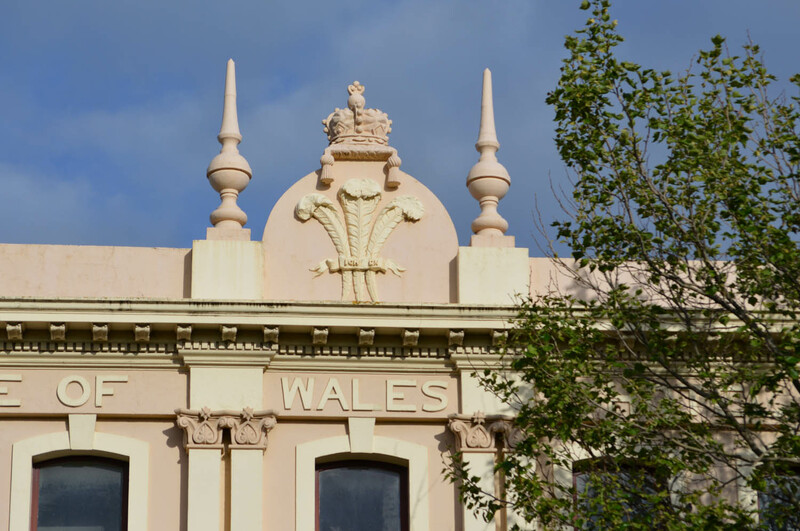 By 1874 it had been plastered over, although decorative details (including cornices and window surrounds) were preserved in rendered form, and the name ‘Farley’s Buildings’ was added to the parapet in relief lettering. 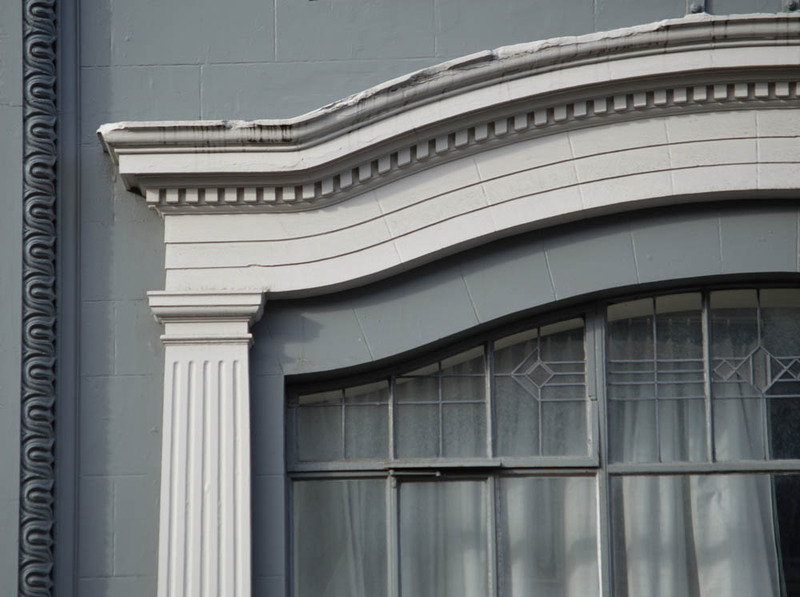 Small additions with windows to Dowling Street were made around the late 1880s, when the street was reformed. 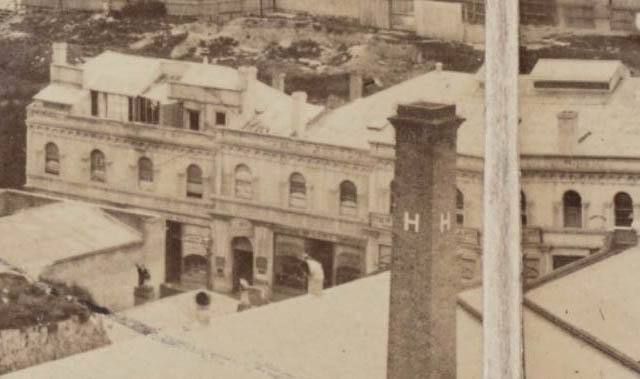 Part of a Burton Brothers panorama from 1874, showing the plastering of the brickwork. 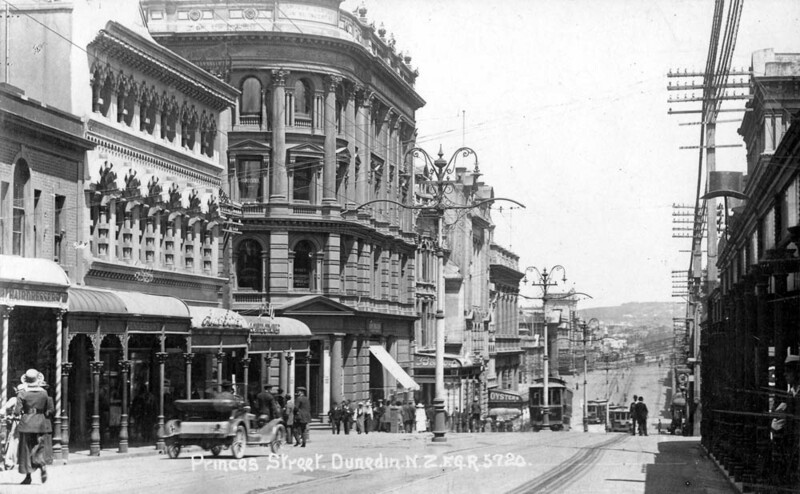 The original block of buildings was the present 126-146 Princes Street. It included five ground-floor shops, upstairs offices, a music/assembly hall, and a photography studio. The studio was in the portion that rises above the Dowling street corner. It was taken by Tait Brothers (Royal Caledonian Photographic Rooms) in late 1863 or early 1864. Later photographers here included Henry Frith, John McGregor (Edinburgh Portrait Rooms), John Gittins Wills (American Photo Company), and Charles Clarke Armstrong. The artist Max Walker had a studio and flat here from 1940 to 1942. He was one of Dunedin’s most out-of-the-closet gay men (at a time when homosexuality was illegal) and was known for his riotous parties. His lease ended after a visit from a particularly rowdy group of Norwegian sailors. 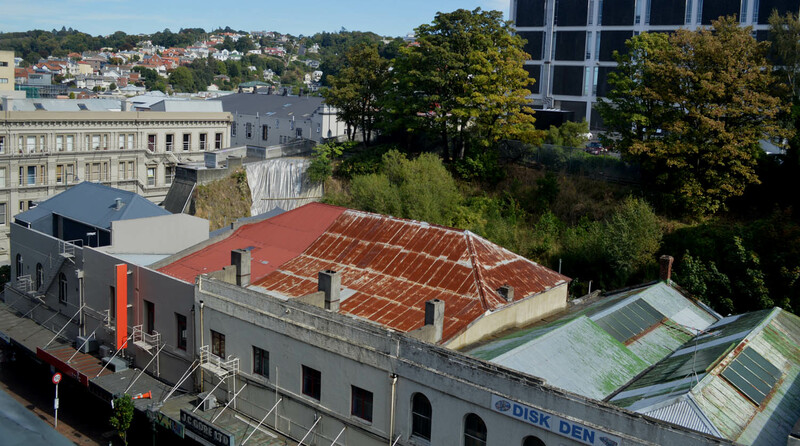 The assembly or concert room originally housed the Dunedin Music Hall, soon better known as Farley’s Hall, under the high roof structure that can still be seen at the northern end of the buildings. It measured 65 feet by 26 feet and was 16 feet high. 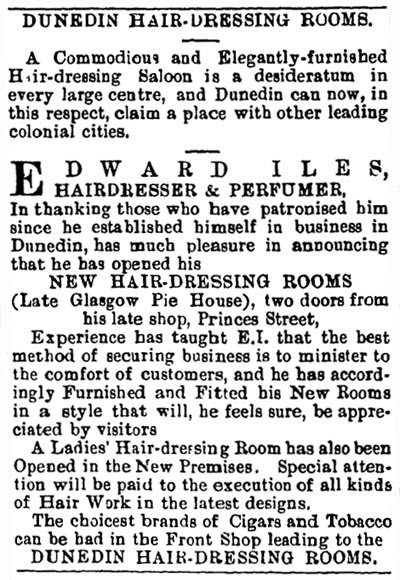 Events held in the 1860s included balls, dance classes, bazaars, banquets, Nicholas Chevalier’s art exhibition, a wax works display from Madame Sohier’s in Melbourne, and Mr Hamilton’s practical phrenology demonstrations which included the examination of ‘Living heads of noted men of Dunedin’. The hall could only hold about 300, so larger new venues were soon favoured for popular entertainments. 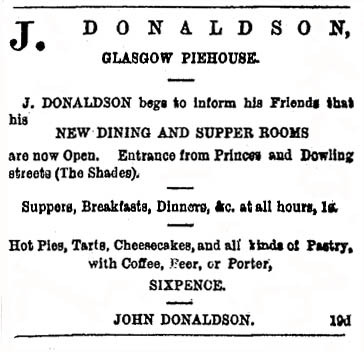 There were many political meetings: Julius Vogel spoke here as did supporters of James MacAndrew prior to his re-election as Superintendent in 1867. 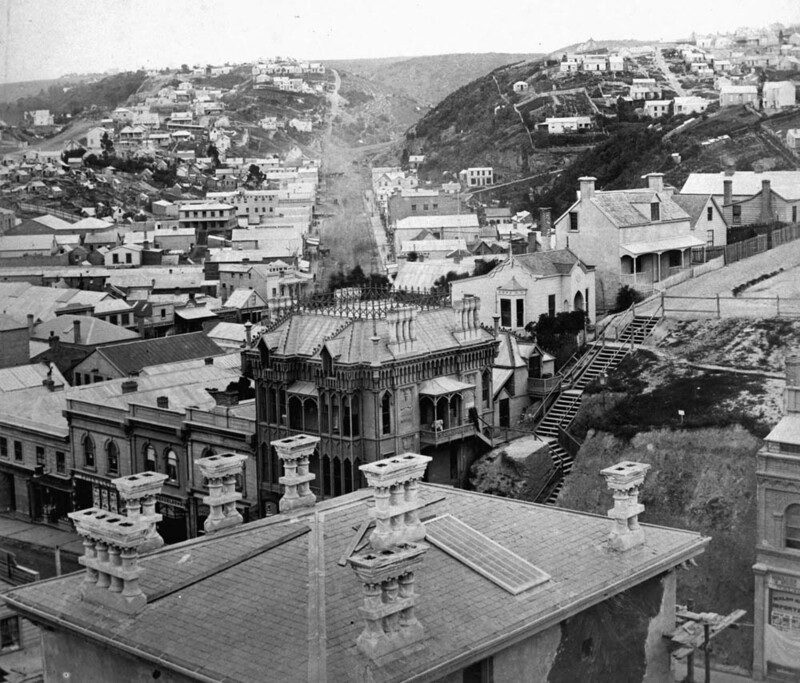 The Otago Provincial Council used the hall as its chambers from 1864 to 1866 (prior to completion of the Provincial Government Buildings), making the buildings a significant site of government in the heady gold rush years. 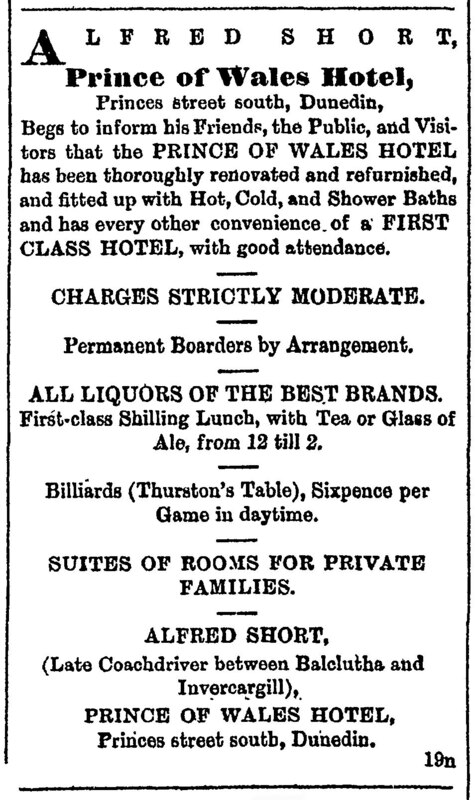 The many other gatherings in the hall took in meetings of company directors, lodges, interest groups, and societies, including the Acclimatisation Society, Caledonian Society, Horticultural Society, Athenaeum and Mechanics Institute, and the Benevolent Institution (which also had offices in the buildings). 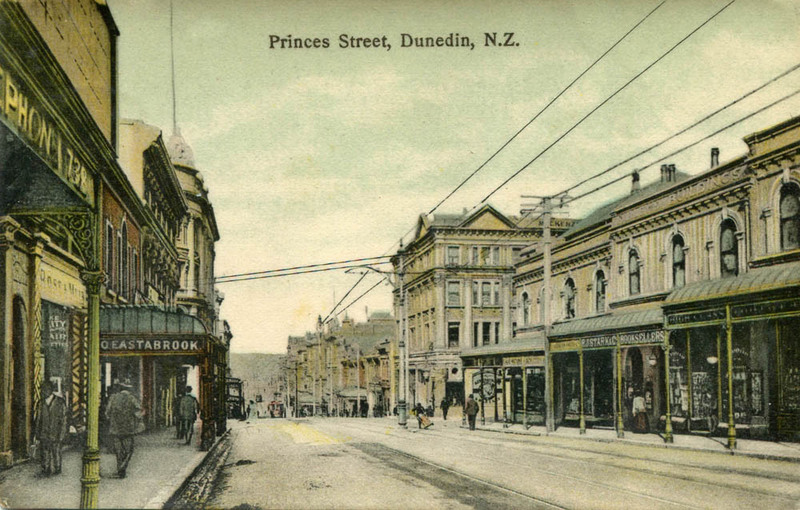 The hall was regularly used for religious meetings, notably the Brethren services led by evangelist Alfred Brunton, who was said to have been the first to introduce the colourful Moody and Sankey choruses to Dunedin. 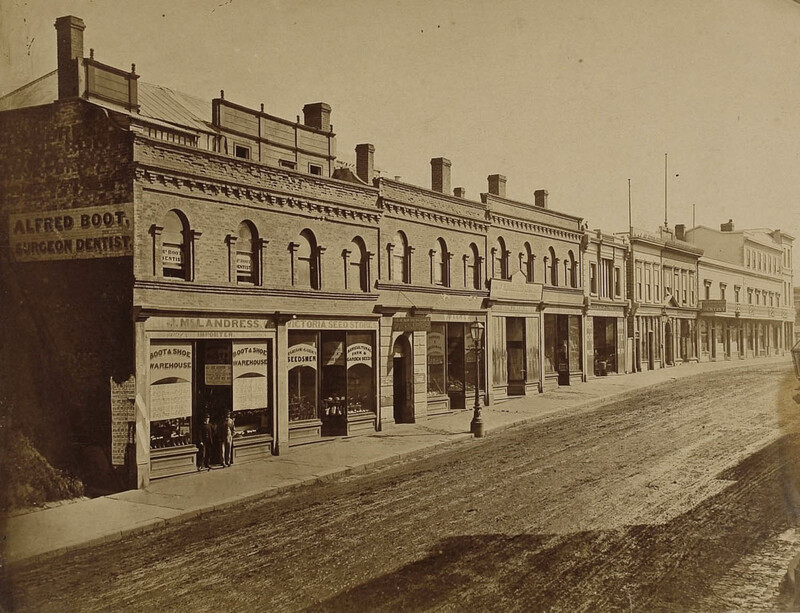 One of Brunton’s famous converts was the bush ranger Henry Garrett, who in 1868 became a member of the congregation but brought much embarrassment on them by burgling the chemist shop below. Brunton’s group moved to the Garrison Hall in 1879 but another group continued to meet in Farley’s Hall up to 1900. Upstairs rooms were set up as offices with the first tenant being the barrister and solicitor G.E. Barton. 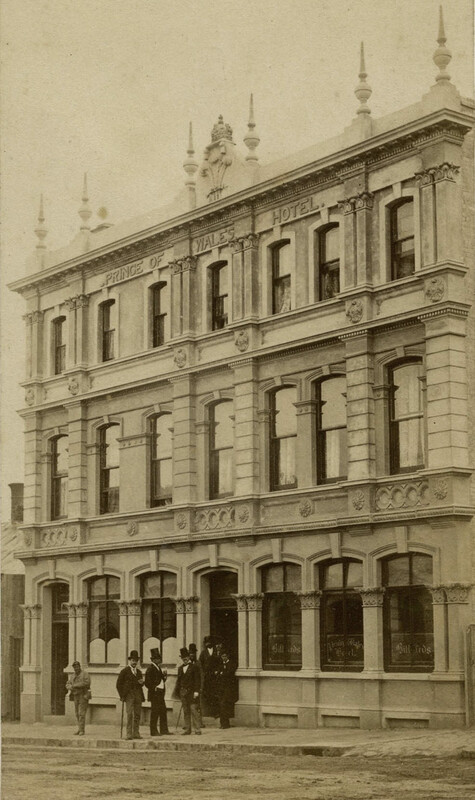 Thomas Bracken of the Saturday Advertiser had rooms in the building in 1878, but so far I haven’t been able to confirm if he was there in 1876, when he ran a competition to set to music his verses ‘God Defend New Zealand’. It’s possible the words were written here. Other tenants in the nineteenth century included John Irvine (Dunedin’s first professional portrait painter), David Henderson (lithographer), Alfred Boot (dentist), John Hewitt (dentist), Alexander Hunter (surgeon), Edmund Quick (consular agent), and Abraham Solomon (pawnbroker). 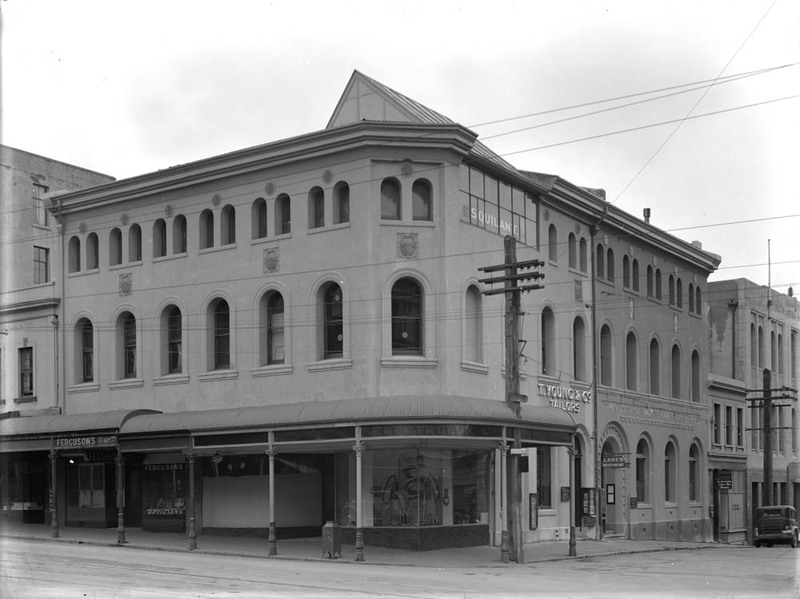 Solomon, who was a leading member of the local Jewish community, purchased Farley’s Buildings around 1880 and permit records suggest at least part of the block remained in the ownership of the Solomon Estate in the 1930s. The ground floor shops were originally let to Walsh Brothers (boot and shoe sellers), Thomas Collins (fruiterer and confectioner), McLeod & Gibson (grocers), and Ure & Co. (tea dealers and warehousemen). 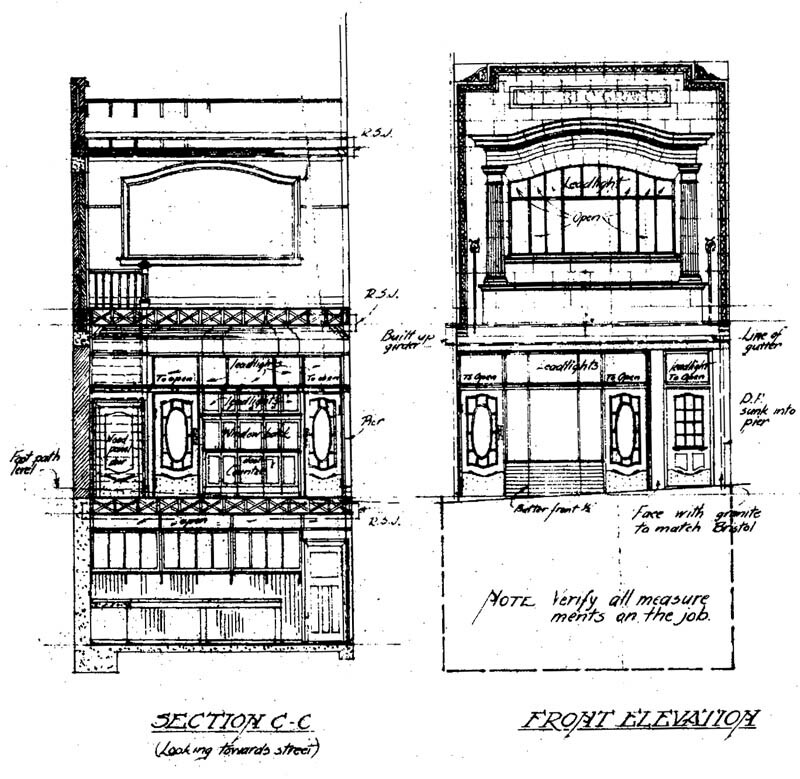 The remaining shop was subdivided for Thomas Bray (hatter and outfitter) and M. Jones. There have been so many businesses in these buildings since then that I won’t attempt to name them all, but some have had particularly long occupancies. 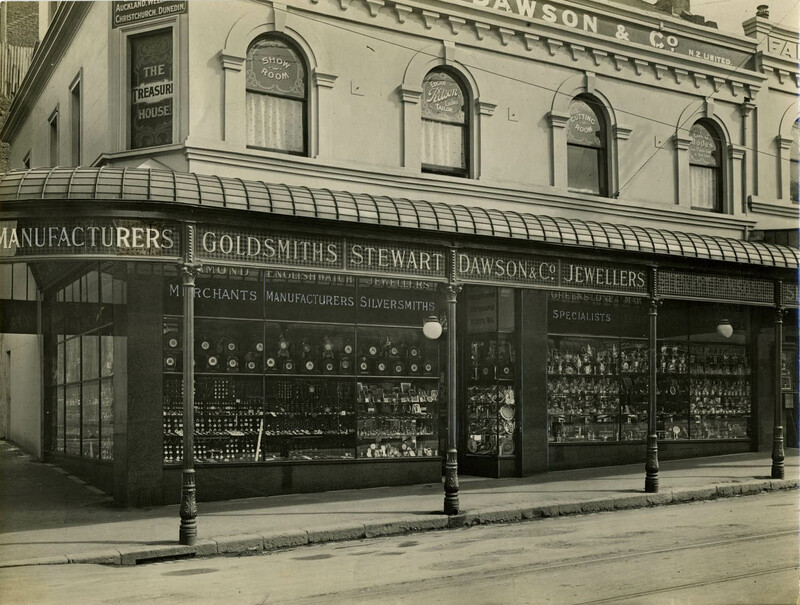 Stewart Dawson & Co., an Australian-based chain of jewellers still in Dunedin, occupied the corner premises from 1902 to 1979. 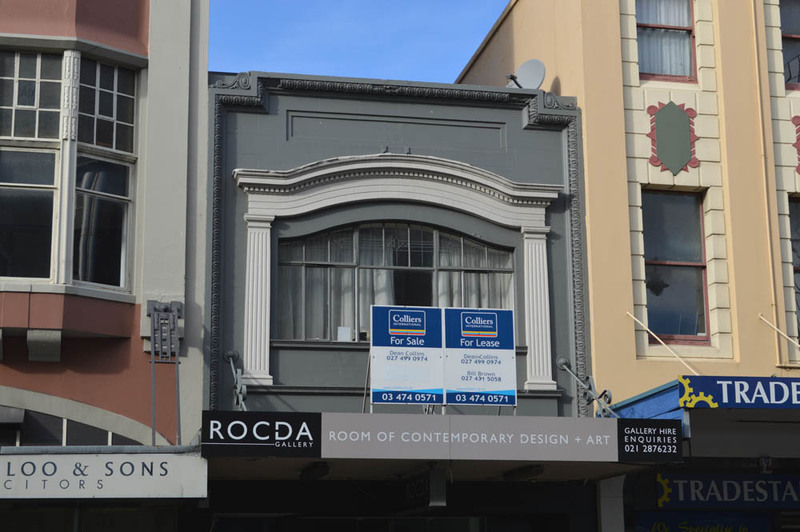 They carried out major alterations before moving in, combining two shops into one, installing new shop fronts, and putting in compressed-steel wall and ceiling decoration made by the Wunderlich Company of Sydney. The colourful and brightly-lit interior was described in the Cylopedia of New Zealand as having the appearance of a fairy palace. The contractor was James Annand. Cookham House, a footwear store, occupied 132 Princes Street from 1904 and later moved to no. 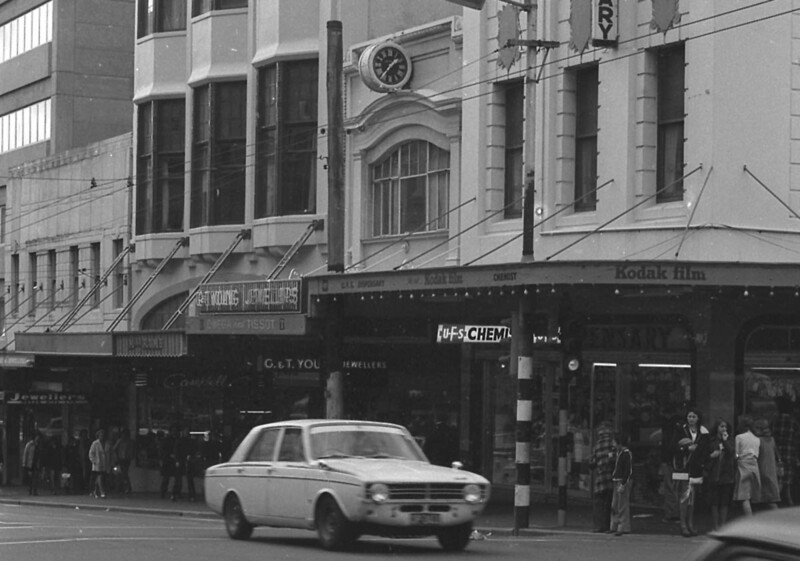 122 before moving to George Street in 1984. 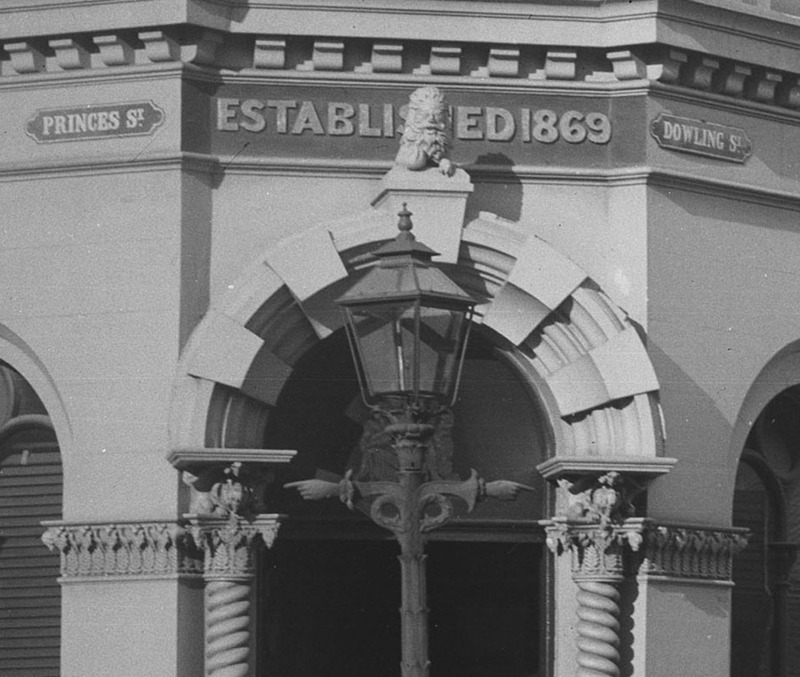 It had been established by John Switzer on another Princes Street site in 1857, although it is unclear if the nineteenth-century history of the firm was continuous (Joseph McKay may have revived the name). Cookham House was associated with the tailors Hamel & McKenzie for many years and continues today in association with Bob Shepherd Menswear. 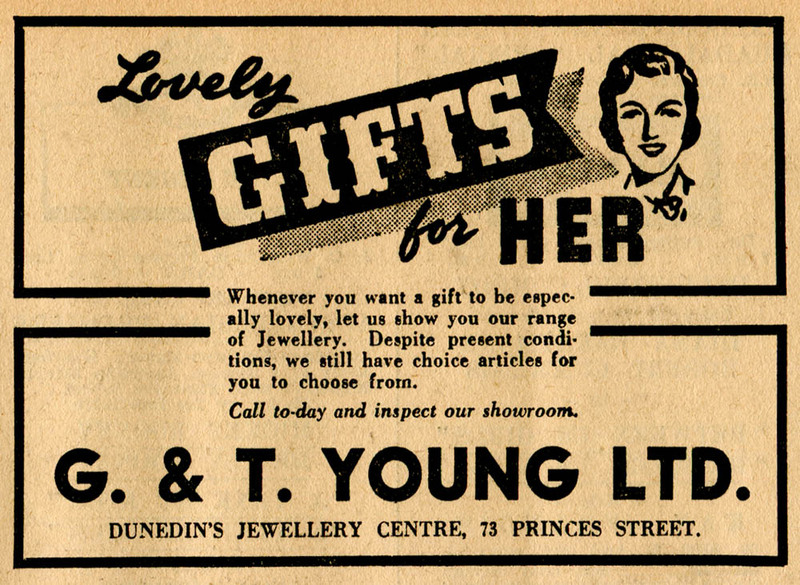 J.C. Gore Ltd, jewellers, went into business at 131 Princes Street in 1949 and moved across the road to Farley’s Buildings (no. 132) in 1962. 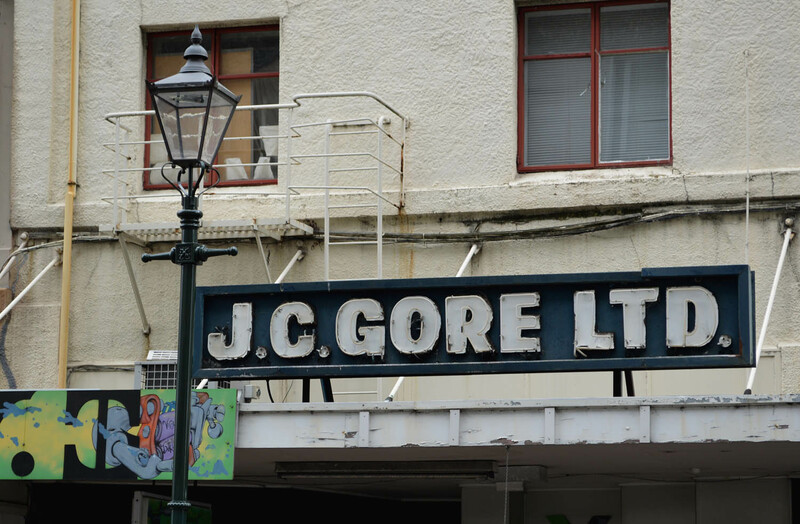 The firm closed in 2005 but at the time of writing their old neon sign can still be seen above the verandah. In October 1906 a fire destroyed the buildings of the New Zealand Bible, Tract, and Book Society, which stood to the north of Farley’s 1863 buildings. 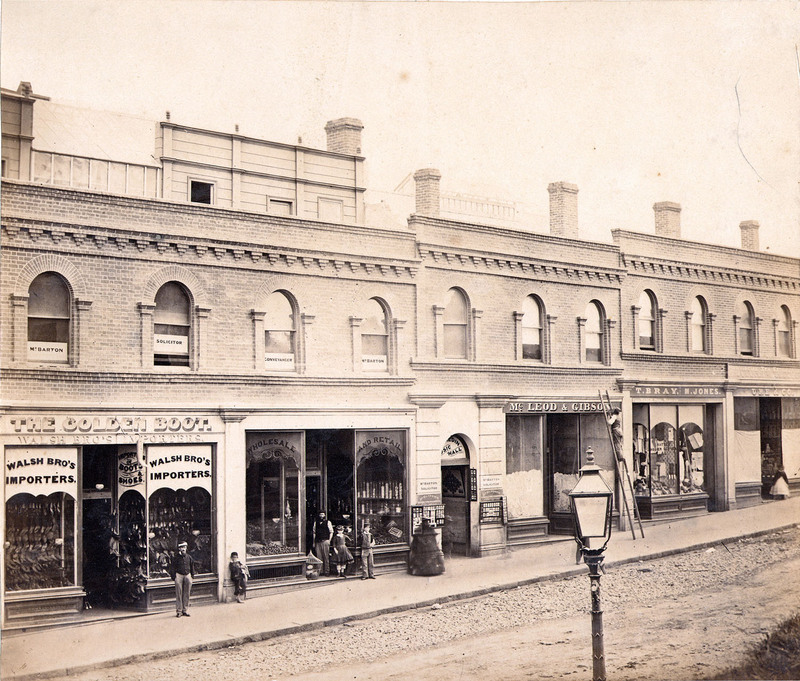 These buildings were also owned by Solomon, who replaced them with new additions to Farley’s Buildings that repeated the old facade decoration. James Annand was again the contractor. The Bible Depot remained there into the 1930s and the buildings are now the home of Disk Den, a music shop that was established by Russell and Alma Oaten in Rattray Street in 1958, and which has been on its present site since 1987. Some original decorative plaster ceilings can still be seen inside. 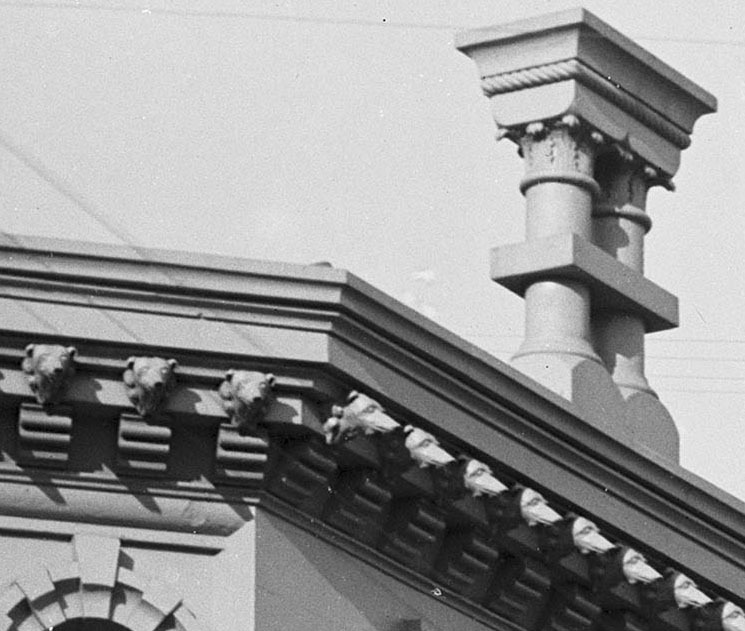 The buildings have seen many physical changes: bullnose verandahs running the length of the buildings were added in 1904 and replaced with hanging verandahs in the 1930s; the facades were re-plastered in the 1940s, when decorative detailing was removed and window openings altered; a large skylight above the hall was removed at some date, and more recently the photography studio has been entirely reclad. Despite these alterations the essential form of the buildings remains intact, and can be more readily seen and appreciated here than in any of Princes Street’s other surviving buildings of the 1860s (most of which are behind later facades). Farley’s Buildings are a rare link with the city’s early history and should be among its most prized heritage. A photograph showing the roofs, with the former photographic studio at the far left and Farley’s Hall under the rusty roof at the centre. 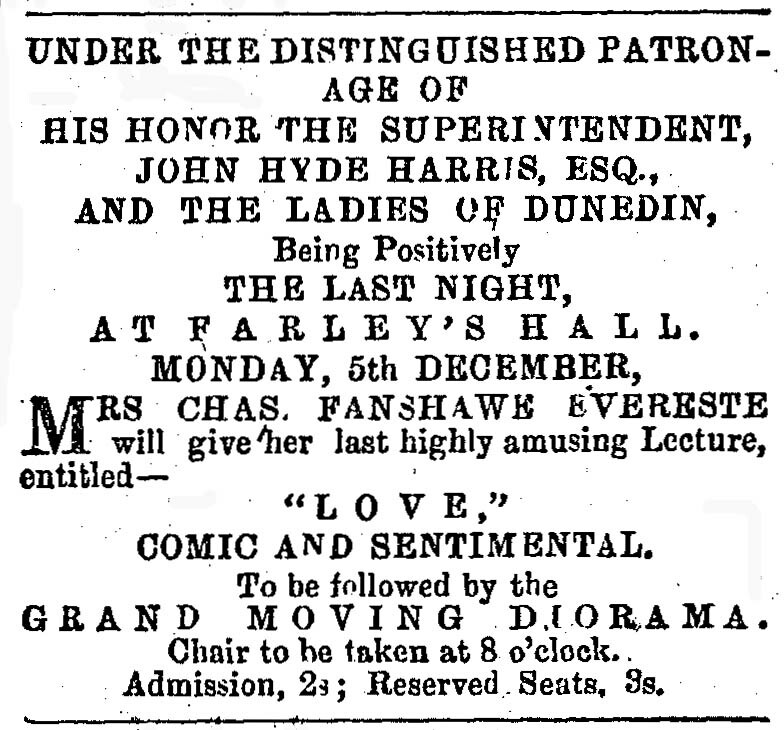 Daily Telegraph, 31 October 1863 p.5 (description); Otago Daily Times, 28 May 1862 p.4 (Theatre Royal), 24 July 1863 p.3 (call for tenders for foundation), 1 August 1863 p.2 (call for tenders), 11 August 1863 p.6 (call for tenders – carpenters and joiners), 16 November 1863 p.10 (Thomas Collins advertisement), 21 November 1863 p.8 (Walsh Bros advertisement), 24 November 1863 p.3 (to let notice – offices), 7 December 1863 p.2 (advertisement for Dunedin Music Hall), 28 August 1865 p.5 (Provincial Council), 27 June 1867 p.1 (phrenology), 4 July 1867 p.1 (accommodation for 300 in hall), 4 March 1873 p.3 (Edinburgh Portrait Rooms), 12 December 1902 p.8 (Stewart Dawson alterations), 26 November 1906 p.3 (Bible Depot fire), 23 February 1907 p.12 (rebuilding), 26 November 1984 p.20 (Cookham House history), 31 July 2010 p.42 (Alfred Brunton); Otago Witness, 20 February 1863 p.4 (Tait Brothers advertisement). Block plans (1889, 1892, 1927); Cyclopedia of New Zealand, vol.4 (Otago and Southland Provincial Districts) 1905; Stone’s, Wise’s and telephone directories; Dunedin City Council permit records and deposited plans; information supplied by Peter Entwisle (re Max Walker); Tonkin, Lance, The Real Henry Garrett. This entry was posted in Buildings and tagged 1860s, Charles G. Smith, Churches, Cookham House, Disk Den, Dowling Street, J.C. Gore Ltd, James Annand, Princes Street, Stewart Dawson & Co., Theatres and halls, Victorian on 29 March 2013 by David Murray.